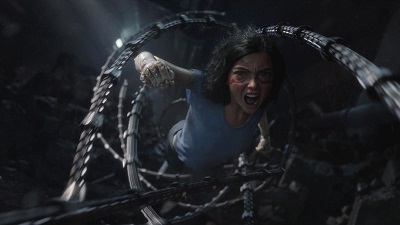 Alita: Battle Angel is a classic ill-advised Hollywoodized adaptation with disparate plotting, bland romance, and wasted actors that make it look like a heap of genre tropes glued together. Set several centuries in the future, the abandoned Alita (Rosa Salazar) is found in the scrapyard of Iron City by Ido (Christoph Waltz), a compassionate cyber-doctor who takes the unconscious cyborg Alita to his clinic. When Alita awakens she has no memory of who she is, nor does she have any recognition of the world she finds herself in. Determined to uncover the truth behind her origin, Alita sets out on a journey that will lead her to take on the injustices of this dark, corrupt world, and discover that one young woman can change the world in which she lives. Because Hollywood studios never learn, here we are with another misfire manga adaptation. As you may have guessed, it’s another big-budgeted studio product. In fairness, the technical aspects of the movie help make it tolerable. The $150-200 million (excluding marketing costs) provide a lot of CGI funding to create fluid action scenes that make Alita intermittently engaging. They are crisp and clear, so even though there’s the predictable 3D money shot, Rosa Salazar’s expressive acting combined with a variety of fights make this sci-fi action movie serviceable. It’s typical set-ups – a bar, an arena, a back alley – but its good enough for sleepover entertainment. This is a kind of movie that you can watch in 3D if you have money to spare and two hours to turn your brain off. The cinematography is good too. Even though the cyberpunk landscape here isn’t anything distinct, it’s not purposefully dimly lit in a mediocre attempt to convey the dystopian gloom and doom. Iron City looks like a convincing enough town in its movie universe with a pop of color here and there to balance with steel grays and rust. There are hints here of the blurred line between good and evil. Alita herself is a warrior from a faction believed to be the enemy. Zolom is a paradise and looming figure of class divide. Motorball creates illegal yet lucrative jobs for the poor while giving them respite as a symbol of escape. Unfortunately writing isn’t James Cameron’s strongest suit. Further saddled by the bulk of the source material, the movie becomes a collection of tropes featuring sci-fi greatest hits. The writers did attempt to inject some story elements from its source material, but they’re injected into half-baked plot strands that are also badly stitched together. A coming-of-age tale is mixed with run-in-the-mill corruption, old western bounty hunting tropes, and a throwaway gladiator sport with a prize for freedom. In between there’s a hint of classism, a nod to illegal organ harvesting, and the ever present question of romance between a man and machine. And did I mention there’s a mysterious big bad that can just hack into any cybernetic consciousness? These are all piled around Alita that she ends up fighting – and failing – clunky plotting. The convoluted narrative makes it hard to see what Alita is really fighting for. And the stereotypical characters around her don’t help. The cast are wasted that a bland romance made newcomer Keean Johnson even more forgettable. Ageless Jennifer Connelly and perfectly cast Mahershala Ali are the only ones with a hint of novelty. Rosa Salazar didn’t need to be digitally rendered but Robert Rodriguez thought that anime eyes on a photorealistic animated cyborg fits in a real-life adaptation of a manga, so she’s as relatable as your grandma’s creepy porcelain doll. In the end, Alita finally remembers her purpose, gets hardware upgrade, and reminds you what this movie is supposed to be about. Alita: Battle Angel is just another ill-advised Hollywoodized adaptation with a botched script designed to make blockbuster money.